Rifle and Pistol athletes of the USA Shooting Team have been anxiously watching their Shotgun counterparts at two International Shooting Sports Federation (ISSF) World Cups already this year, and now it’s finally their turn to start the World Cup season as the first one for Rifle and Pistol starts Friday in Changwon, South Korea. Air Rifle and Pistol athletes have been waiting for the chance to win medals and earn Olympic quotas since early December when they earned their team berths at the Winter Airgun Championships in Colorado Springs. Smallbore (.22 caliber) rifle and pistol athletes were chosen at separate selection matches in January and February. Winning Olympic quotas at these events are of utmost importance for the USA Shooting Team with limited opportunities to do so available throughout 2015. A quota spot is essentially the entry ticket necessary for a country to compete in Olympic competition in a particular discipline. USA Shooting athletes winning Olympic quotas will still have to earn the right to compete separately. Thus far in the Rifle and Pistol events, the U.S. has only earned one quota each in Men’s Air Rifle and Men’s Air Pistol, with the potential to earn up to an additional 18 prior to the 2016 Olympic Games in Rio de Janeiro, Brazil. More information on selection procedures and quotas for 2015 World Cups and the 2016 Olympic Games can be found here. With each of the 68 nations to be represented at this World Cup, the 571 athletes that will compete represent everything from numerous Olympic and World Cup medal winners, to newer athletes on the scene looking to earn their Minimum Qualifying Scores (MQS). The 28 athletes that comprise the USA Shooting Team are no different – ranging from 24-time World Cup medalist Matt Emmons (Browns Mills, New Jersey) competing in Men’s Three-Position and Prone Rifle, or 15-time World Cup medalist Emil Milev (Temple Terrace, Florida) who will shoot Men’s Rapid Fire Pistol, to the youngest member of the team, 16-year-old Sarah Osborn (Hampton, Virginia) who will make her World Cup debut in Women’s Air Rifle. The Rifle athletes of the USA Shooting Team started 2015 strong and look poised to continue doing so at this World Cup. 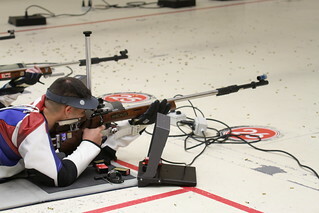 Earlier this month, 2012 Olympian Michael McPhail (U.S. Army Marksmanship Unit/Darlington, Wisconsin, pictured) posted a Qualification score in Men’s Prone at the Spring Selection Match that would have tied a world record. In January, three-time Olympic medalist Emmons topped a world-record Finals score in Three-Position during the selection match for this World Cup. These two Olympians will also be joined by two-time Olympian Eric Uptagrafft (Phenix City, Alabama) in Prone. Although Texas Christian University junior Hannah Black (Richmond, Virginia) will make her World Cup debut in Changwon, look for her to perform well too as she shot a 591 at the January Selection Match – one point off a world record in Qualification. Olympian Amanda Furrer (Spokane, Washington) is also set to compete. Leading the Pistol contingent will be two-time Olympian Keith Sanderson (Colorado Springs, Colorado), who equaled a world record of 35/40 hits during a Rapid Fire Pistol Final at the February Selection Match. He will be joined in the event by five-time Olympian Milev and USAMU’s Brad Balsley, (Uniontown, Pennsylvania) who was the U.S. team’s highest finisher in Rapid Fire Pistol in 16th place at last year’s World Championship. Balsley’s USAMU teammate, Men’s Free Pistol and Air Pistol National Champion James Henderson (Midland, Georgia) will also be competing in those same events in Changwon while 2008 Olympic veteran Brian Beaman (Selby, South Dakota) is set to compete in Free Pistol as well.